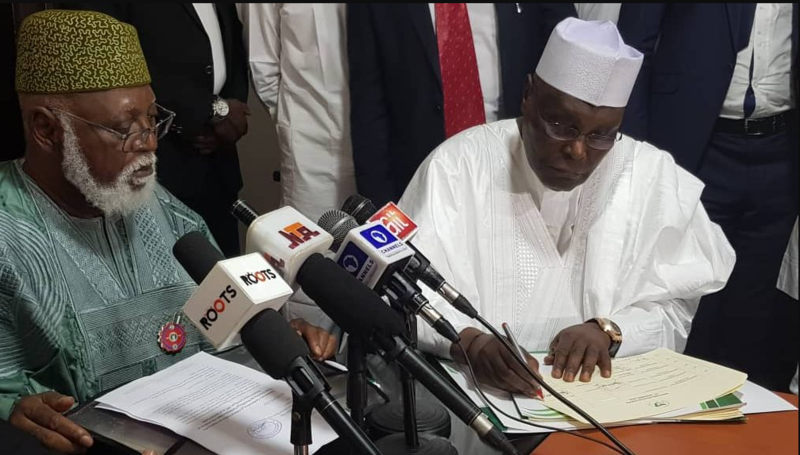 Alhaji Atiku Abubakar, the Peoples Democratic Party (PDP) Presidential Candidate, has signed the Peace Accord. The former Vice President signed the Peace Accord at the Kukah Centre on Wednesday in Abuja. Atiku used the occassion to appeal to President Muhammadu Buhari to sign into law the Electoral Act Amendment Bill ahead of the 2019 general election. The PDP presidential candidate had earlier said that he could not make it to the signing of the document by the presidential candidates of other political parties on Tuesday because he did not get an invitation for the event. He, however, expressed delight that Buhari agreed to sign the peace accord alongside other presidential candidates. “I am delighted that the President has agreed to sign this peace accord, but we want to appeal to him to also sign the Electoral Act Amendment Bill. “Mr President needs to understand that as long as he refuses to sign this Bill, we will have doubt that this government is truly committed to a true, fair and credible election,” he said. Atiku maintained that he was not a converted democrat but a real democrat from the beginning who alongside other leaders fought the military to return this country to democracy. However, he said that the best way to guarantee peace in any election or human interaction was to ensure manifest justice to all concerned. Earlier, Alhaji Abdusalami Abubakar, former Head of State and Chairman, National Peace Committee, apologised for not having the PDP presidential candidate at the signing of the peace accord held on Tuesday. He said the news that the PDP boycotted the signing of the accord was completely wrong. “I must apologies for the omission or commission, that the PDP was not able to attend that ceremony. “The news that PDP boycotted the signing of the accord yesterday is completely wrong. I spoke to the presidential candidate and the party officials. “It was not only the PDP that was not there yesterday, one or two parties were also not there,’’ he said. He stressed that everybody involved in the project cared for peace and wants a peaceful election in 2019. The News Agency of Nigeria (NAN) reports that the political parties and their presidential candidates, especially, are to commit to issue-based campaigns and to avoid hate speech. According to the peace accord, they are also to publicly speak against provocative utterances and oppose all acts of electoral violence. They are also expected to support all government institutions including INEC and the security agencies to act and be seen to act with impartiality.